The document solutions Sandton needs. If you work in an office you have no doubt dealt with, or been exposed to, the dreaded filing system at one point or another. Yes, this is the digital age, and computers can be used for filing too, but computers can get just as cluttered as the filing cabinet looming over you from the corner of your office. We, as humans, are tactile, which is why physical filing is still so popular. However, a disorganised filing system is like kryptonite to an office worker. 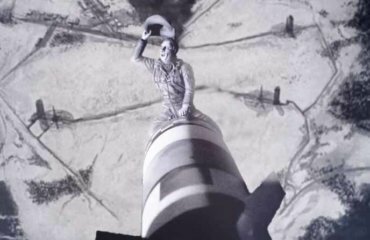 Picture the scene: your boss is standing over you, tapping his toes as you scramble through a heap of papers. A single bead of sweat is working its way down the back of your neck. Sound familiar? If not, congratulations! However, if it does, this article is for you. 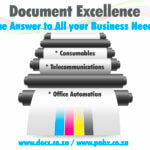 DocX, providers of the finest document solutions Sandton can boast, is here to help. Filing is a form of discipline. This is not to say that you need to spend months in solitude, practising the art of filing, young grasshopper. It does, however, mean that you need to commit yourself to proper filing when you receive any given document. It’s so easy to just add the latest batch of documents to the pile on the corner of your desk, thinking that you’ll arrange them when you have more time. The truth about office work is that you rarely have more time. And, even if you do find yourself with little to do, the thought of filing has probably already slipped your mind. Of course, humans are unique, so different systems will work for different people. But, if you’re at a loss, the following will help you find order in the chaos. Sieve out the gold: Just because a particular document lands on your desk, doesn’t mean that it’s important. Be sure that you keep what is important for the necessary file, and liberate the rest. Properly name your files: This involves selecting a way of naming folders, and sticking with it. It may require a complete reboot initially, but it will pay off next time you’re looking for a particular document. Use one folder per project: It is tempting to want to store similar types of documents together, but this can cause chaos when you need all the documents for a project. However, if a project folder contains documents of different types, it will be much easier to find the document that you’re looking for. Don’t stuff folders: If your designated folders are too broad, in the implied sense, try making them more specific. For example, the folder entitled ‘Budget’ could be split into years, or quarters, which will make locating certain documents much easier. Back-up: There will, inevitably, come a time when you run out of space in your filing cabinet and have to throw away some old files. But, just to be on the safe side, scan these old documents into folders on your computer. You never know when you might need them. A de-cluttered filing system leads to a de-cluttered mind. 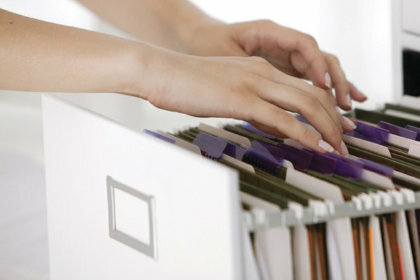 So, for your own peace of mind, take some time in the next few days and organise your filing system. This way, the next time your boss is standing over you, you’ll have the right file before the toe-tapping begins.